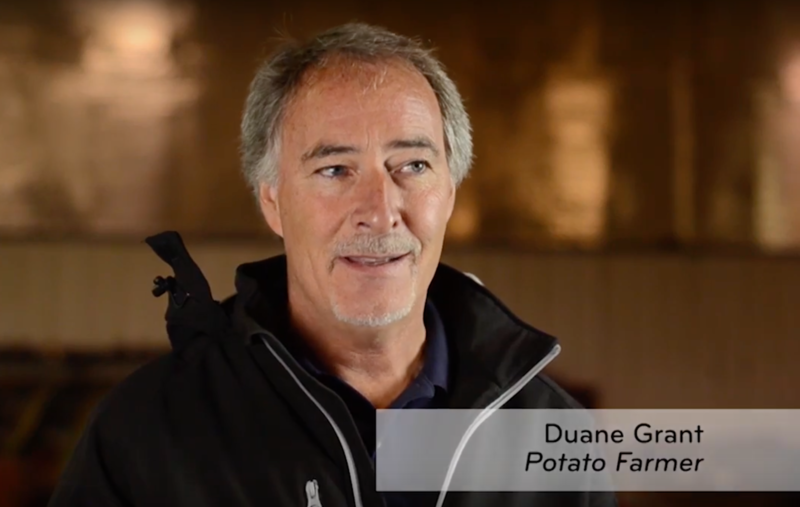 Innate® uses modern bioengineering techniques to bring together some of the best traits from different types of potatoes. Innate potatoes grow just like regular potatoes, but are developed specifically to bruise less and produce less asparagine. USDA & FDA approved. c308 introduced a few interactive elements when building the InnatePotatoes.com website. 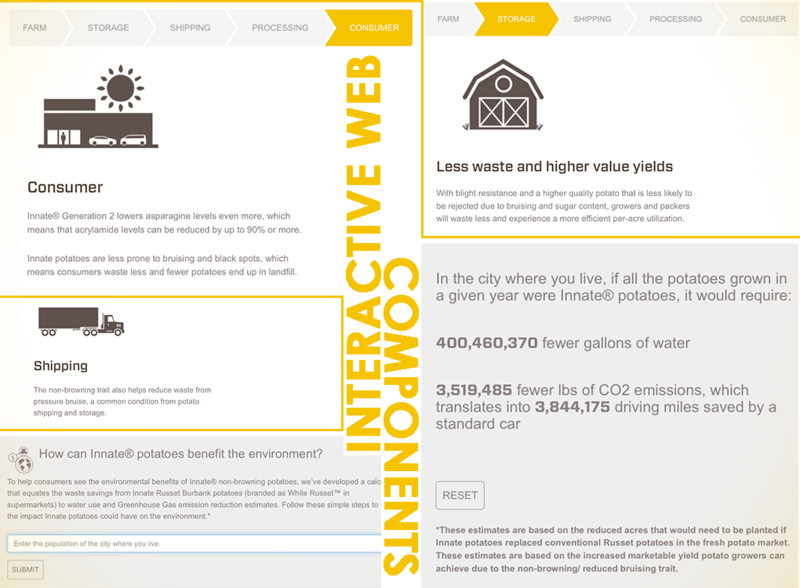 Features include a calculator, into which visitors can enter the population of their city to learn how many resources could be saved if all the potatoes consumed by that population [for a year] were Innate® grown. Another tool recreates the production chain of potatoes from Farm to Consumer, allowing curious guests to click through and read about the benefits Innate offers at each stage. 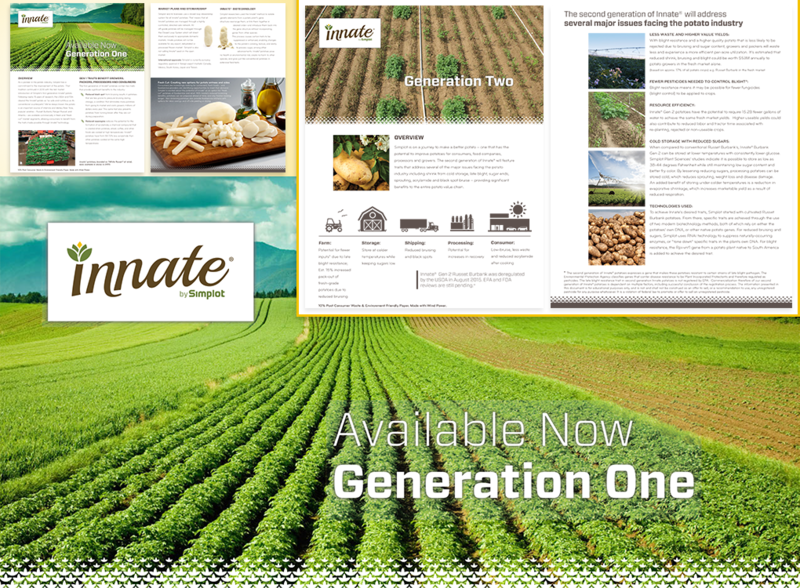 Periodically updated or altered for specific audiences, these Generation 1 and 2 data sheets highlight the advantages of Innate® potatoes. Designed to be skimmed — or used as talking points for employees at conferences like Potato Expo — the format is colorful, succinct, and compelling. c308 interviewed an Idaho potato farmer, cutting a handful of videos from the footage to educate consumers about the benefits of Innate potatoes.